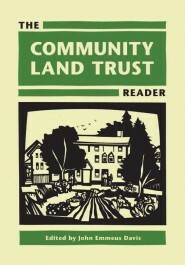 The Community Land Trust Reader, edited by John Emmeus Davis and published by the Lincoln Institute of Land Policy (www.lincolninst.edu), brings together the writing that inspired and defined the community land trust movement, including essays by Equity Trust founder Check Matthei and several past and present board members. The book also excerpts two chapters from our farm preservation manual, Preserving Farms for Farmers. The full collection of essays in the CLT Reader, assembled together for the first time, trace the roots, evolution, and prospects of the community land trust from the visionary ideas of people like Henry George, Ebenezer Howard, Ralph Borsodi, and Arthur Morgan, to the model of affordable housing flourishing today in hundreds of U.S. communities. It shows how the CLT innovation in land tenure, combining common ownership of land with individual ownership of the buildings located on that land, has roots in experiences as diverse as the Garden Cities of England, the Gramdan villages of India, and the southern Civil Rights Movement, and it explores new opportunities for using this model to protect land and property for community benefit.